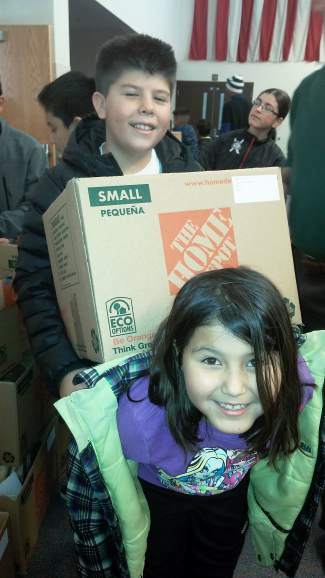 A brother and sister help carry a box of food at the Salvation Army Vail Valley offices over the weekend as volunteers put together Christmas food baskets for families in need. Don't forget to spread the holiday cheer to other local families this season. EAGLE COUNTY — Last weekend, volunteers flooded the Vail Valley Salvation Army offices to load and pack nearly 650 food baskets that would be delivered to Eagle County families in need this Christmas season. The baskets were loaded with all of the goodies and trappings for a holiday meal, and for many families, the basket provides a much-needed gift and respite for a busy and often cash-strapped season. Christmas is a time when people are feeling generous and a time we’re thinking about giving. In fact, December is one of the Salvation Army’s biggest times for giving and volunteering, said Tsu Wolin-Brown, of the local Salvation Army. “People are doing it in neat ways. We have some people who are even adopting a family this Christmas in honor of their mom, who doesn’t live here,” Wolin-Brown said. So whether you give as an honorary gift to someone else or just for the sake of giving, here is a list of Eagle County charities — and by no means is it complete — where your gift will keep on giving. Cash donations will help offset the nonprofit’s expenses for the food baskets and Christmas gift programs, as well as extend into the rest of the year. In addition, they need food donations and volunteers to help deliver items. There are a number of ways to give. Stop by the Salvation Army’s offices in Avon (behind Wells Fargo), drop your donation into a Salvation Army bell ringer’s kettle (or volunteer to be a bell ringer), or go online to http://www.salvationarmyvail.org. Donate or learn more at http://www.salvation armyvail.org, or mail donations to P.O. Box 2183, Edwards, CO 81632. This winter has been a tough one so far for the Eagle Valley Humane Society. A respiratory illness has been continuously making the rounds at the organization’s cat shelter, and they’ve also been uncharacteristically overloaded with kittens. “Our foster homes have been amazing — doubling up and dealing with the overflow,” said Executive Director Char Gonsenica. The options for giving back to furry friends are vast. For monetary donations, an anonymous donor will be matching all donations of up to $5,000 for the month of December, so your gift will be doubled. The Humane Society doesn’t need any food or supplies for the moment, but it is in need of volunteers to work at the cat shelter and foster homes for the animals. “I think animals are a gift to us, so I think when you give, it’s a gift that gives to them and to us,” Gonsenica said. Of course, you can also adopt a furry friend for your family or loved one. While there’s nothing better than a new puppy on Christmas Day, Gonsenica said people should make sure everyone in the adopting family is in agreement about the new addition. Otherwise, the dog or cat could end up right back where it started. Donate or find out more at http://www.adopta friend.org. The Bright Future Foundation quietly works behind the scenes, but its work has a major impact on a number of Eagle County residents, especially women and children. The organization offers services, including a safe house and counseling, for individuals affected by violence. Unfortunately, said Executive Director Sheri Mintz, the need for these services goes up considerably over the holidays. Give back with monetary donations or by giving nonperishable food items and grocery store gift cards for the shelter pantry. Buy someone (or yourself) a ticket to the upcoming Beaver Creek Winter Culinary Weekend from Jan. 21 to 24, where Bright Future Foundation will be the nonprofit beneficiary. Also give the gift of your time by volunteering as a senior buddy and positive role model for the Buddy Mentor program, or you could become a hotline advocate, helping provide confidential support and referral services to individuals and families in need. Find out more at www.mybrightfuture.org. The new year will be a big one for Starting Hearts, a nonprofit that works to train people in lifesaving CPR techniques and provide the community with automated external defibrillators. The organization recently announced plans to place 50 additional AEDs around the community, in partnership with Vail Valley Medical Center, bringing the total to 350. Additionally, Starting Hearts will be expanding its training in 2016, hoping to teach about 10,000 Eagle County residents CPR. Funds are needed for those efforts, especially for the CPR classes. Your gift has the opportunity to be matched through Crowdrise. To donate, go to http://www.crowdrise.com/startingheartssavemo/fundraiser/startingheartsinc. “Our funds go to CPR and AED training and placement of defibrillators in public, so every contribution helps to make lifesaving techniques and medical devices always and readily available in our community,” Himelfarb said. See http://www.startinghearts.org for more information. In a mountain town, there’s no better gift to give than the gift of the outdoors. SOS Outreach started in the Vail Valley 22 years ago and now has reached more than 45,000 youth across the country through its outdoor activities, mentoring and leadership programs. In Eagle County, the nonprofit will serve 550 youth this winter, allowing them to ski and snowboard, encouraging goal setting and teaching kids core values. The holidays are an incredibly busy time for the organization, with programs at 31 mountain resorts in six states. All are under way over the Christmas holidays, said Rebecca Gould, development and marketing director. Donate your time by becoming an SOS mentor for either a summer or winter activity, helping run an event or becoming a chaperone. The organization is also always in need of ski and snowboard gear, including clothing. Give by going to http://www.sosoutreach.org and clicking on the “Donate” tab.